As the CEO of a Glazier contractor or a Project Manager or simply having a administrative position, we have been constantly evaluating business processes on both the Micro and Macro level. Yes, these are the the 2 M’s I am shifting my perspective to and fro. I wanted to write about this because I run a small business and therefore as any CEO would have it, my top concern is GROWTH. And so as I was beefing up my business skills I became conscious about my micro and macro perspectives about steering the business to success. I am not referring to the term micromanagement in leadership and I would like to make it clear I am pertaining to decision making, establishing company culture, and all thoughts related to making organization-wide decisions that would better the company and micromanagement is not on the list. Since my business sells the competency/expertise of my men, they are then my most valuable assets. On the the Micro level I figured I was always thinking about I could effectively leverage my team’s skills and capabilities and then how can I improve their performance, upgrade their skills, increase their job satisfaction, and make them grateful for being a part of my company. It is interesting to note that efforts in fine-tuning the business operations on the micro level, brings us to think about the progress it could result on a macro level. It makes sense when it’s done that way. That is why, It is best to make it a conscious strategy to balance time and effort for both. Are we ahead of time? Are we making swift progress? Can my PMs gauge their team’s progress? How do the clients regard our team’s work? What can we do to ingrain the kind of value we wish to give our clients to every member of the team? Are the crew members happy? Are they safe? Do they have what they need in the jobsite? Are the tools enough? Are they in mint condition? These are just a few MICRO level focal points which I bet keeps any manager’s mind busy. They are obligatory especially because these concerns show up as we dive into projects. See, it basically concerns all that is necessary to carry on with the current operations smoothly and rewarding or satisfying for all. That includes the management, the clients and the workers. A job well done that is done with ease and no lasting negative impact on the worker’s morale. Excellent work is that which is worthy of the client’s praises and referrals. A job well done is that which has a positive ROI for the business. On the Macro level, thoughts are concentrated on reports. Macro perspective involves ideas which are influenced by the desire to level up. IF you choose to spare time to take note of the micros you should easily come up with great ideas and innovations that would serve the company well. It requires analysis of what the micros actually mean and warrant. What developments can be made to position our crew as experts in what they do? Who among our crew deserves a promotion? who among them are seen to be fit for an expert training? What would our workforce appreciate such that it will increase their satisfaction? How can my mechanics become better problem solvers? Better communicators? What are the newest technology and trends in the industry that our crew should get their hands on? What new set of tools can we use to double efficiency? Promote accuracy? For small glazier companies, it’s easy to get caught in the web of things and just remember to think on a macro level when consistent challenges already prompts you to. But as I said, I think the conscious marriage of both micro and macro perspectives promotes growth, thus macro decisions should become a mainstay in your play. Both MICRO and MACRO perspectives serves to achieve goals. Since MICRO is being attentive to what needs to be ensured at present… It spells PROGRESS both forward and upward because it ensures better execution of your company’s services. MACRO is being analytical about how we can sprint towards GROWTH. This spans all aspects and directions. This includes employee benefits that would better their performance, training the crew on exciting upgrades to their skills. This also may lead to embracing new technologies and process enhancement to impress clientele. Perhaps automation of some crucial business processes can be one of the decisions, and you can come up with many more. 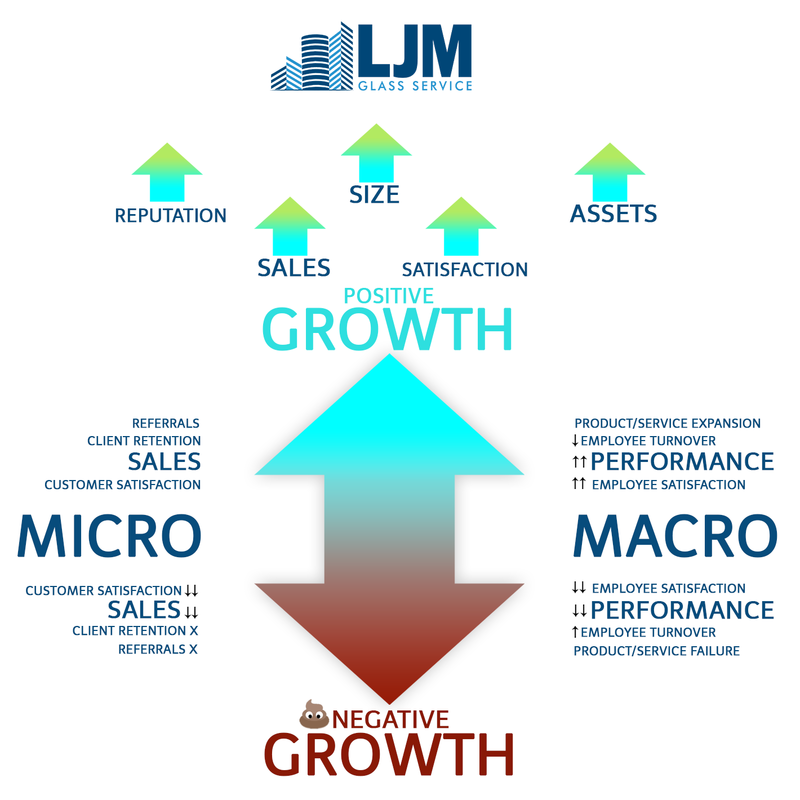 In short, attention to the MICRO = PROGRESS and decisions made on a MACRO level = GROWTH, both are needed to propel the business to greater heights. We all strive for customer satisfaction, and increase in revenue. The business steadily progresses and we are happy. But we also strive for excellence and look for means to set us apart from the competition in all aspects. We wish to grow our empire in size and value and have a company culture enjoyed by our employees. A glazier company may seem easy to scale as it focuses only on glass packages for the project scope but it is easy to miss important factors that on a hindsight could have been made avoidable by spreading your attention to cover both micro and macro levels. Because these missed factors spell trouble and could hinder growth. So MICRO level perspective is for what requires attention and MACRO level is for what most often requires investment. Each supports the other. Both are needed to be interdependent in order to grow a business into an empire (Which is by the way we are ALL IN for right?). In order to expand and upscale a glazier business you need to balance your time to do both as a conscious strategy. Imbue the leaders in our company with the same entrepreneurial spirit as we have in running the business. As top of the organization, I look for ways to solicit the kind of cooperation and empathy crucial in having each leader come up with both MICRO and MACRO perspectives which is their own. It is kind of like giving them the voice to speak their minds about what the company needs on both level. Seasoned executives and successful Glazier company owners know this. I have been running my business for a few years now and I have been actively learning. Topics like this don’t stop with the CEO knowing it and applying it. In setting and aligning goals across my company, we need to train our leaders to have a CEO mindset. Hopefully this encourages them to have a proactive approach and share balanced micro and macro analysis and planning in the discussions. The result that may come out of this balance is scalability, stability and stream-lined operation. All of which are signals that the company is ready for the actual expansion or growth. In which case, you must read on the measures needed to be done before you take the plunge to scale your glass and glazing company.